SNF PHYSICIAN (01.31.2019) – OptumCare is seeking a Family Medicine or Internal Medicine Physician to join our team with our SNF division in Tucson. This position has a flexible schedule where you can set your own 40 hour/week schedule with a highly collaborative work environment whose culture is one of continuous improvement, bottom-up management style and low turnover. Competitive compensation package, including base salary plus productivity bonus. Contact Kaitlin Osborn for more information at Kaitlin_Osborn@optum.com or call (952) 936-3888. PRIMARY CARE PHYSICIAN (01.31.2019) – OptumCare, is seeking a Family Medicine or Internal Medicine Physician to join our team in Tucson. We are proud to offer a convenient Monday–Friday schedule with a highly collaborative work environment whose culture is one of continuous improvement, bottom-up management style and low turnover. PRIMARY CARE PHYSICIAN (PHOENIX) (01.31.2019) – OptumCare, is seeking Family Medicine or Internal Medicine Physician to join our team in Phoenix. We are proud to offer a convenient Monday–Friday schedule with a highly collaborative work environment whose culture is one of continuous improvement, bottom-up management style and low turnover. PHYSICIAN ALLERGIST (01.29.2019) – Allergy Partners of Arizona is a growing allergy and immunology specialty practice. We service Tucson, Marana and Oro Valley and are looking to expand in outlying areas. The practice is looking for a physician allergist who would be interested in pursuing partnership status within the group. Please reach out to learn more about this opportunity! OPHTHALMOLOGIST (01.29.2019) – Fishkind, Bakewell, Maltzman, Hunter and Associates Eye Care & Surgery Center, Tucson, AZ. Opportunity to join a six-provider practice with ASC/optical. Glaucoma or oculoplastics subspecialty or medical ophthalmologist, who will perform at least 50% general medical ophthalmology (including lasers and injectables), is desired. Must be BC/BE. Competitive salary and production bonus available; competitive benefits package, including 401(k). To submit your CV for immediate and confidential consideration, please email directly to providers@bsmconsulting.com. The practice has partnered with BSM Consulting to conduct the application process. For more information, please visit here. FULL-TIME PEDIATRICIAN (01.30.2019) – Great family and golf community. Full-time Pediatrician BC/BE to join well-established Pediatric practice in Tucson, AZ. Competitive salary with excellent benefit package, including bonus compensation. Send CV to kolleenr@comcast.net. CHIEF MEDICAL OFFICER (04.09.2019) – P3 Health Partners Arizona is looking for a Chief Medical Officer. If you are passionate about your work; eager to have fun; and motivated to be part of a fast-growing organization in Tucson, Arizona, then you should consider joining our team. CARDIAC AND/OR VASCULAR ULTRASOUND TECHNICIAN (04.16.2019) – Cardiology office looking for a registered cardiac and/or vascular ultrasound technician to work afternoon/evenings and weekends at Richard A. Cohn, MD 6565 E. Carondelet Drive, #225 Tucson, AZ 85710. Please email resume to rcohncardiology@aol.com. FAMILY PRACTICE CLOSED. MEDICAL EQUIPMENT AVAILABLE – Cushing Street Family Practice has closed. If you are interested in any of the items listed below contact Molly Wheelwright 971-0400 or Ricci Silberman at 248-1216. Office space is also available by contacting realtor David Volk. OFFICE SPACE AVAILABLE (01.30.2019) – Medical office space near Grant and Country Club for one physician, with one receptionist and one nursing desk and three exam rooms. Ideal for an individual internist, family practitioner, pediatrician or other specialist. Access to fax and copy machines and the area is wired for telephone. All the rooms are wired for ethernet access. The rent would cover the space and utilities, internet access, copying and fax privileges. Asking in the neighborhood of $2,750 per month inclusive of the above. If interested, contact gmakol@alvernonallergy.com. OFFICE SPACE RENTAL FOR HEALTH RELATED SERVICES (03.26.2019) – Thee MD Land & Building LLC office rental space for health-related services (targeted to physicians, nurse practitioners, counselors, therapists, etc.). 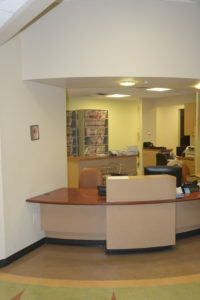 The building houses Alvernon Allergy and Asthma PC, an allergy office with three doctors and support staff. 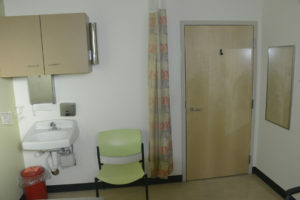 The available space consists of about 1,000 square feet, including one office, two exam rooms, a nurses’ station, a receptionist position, shared waiting area and chart shortage. The address is 2902 E. Grant Road Tucson AZ 85716 (one block west of Country Club Road, on the corner of Grant and Margaret). Rental fees are $18 per square foot, utilities included. Renter is responsible for telephone and ISP bills. Contact Dr. Uwe Manthei by calling (520) 322-8361 or faxing (520) 322-8462 0r e-mail at umanthei@alvernonallergy.com. To see multiple photos of the rental space, click here.